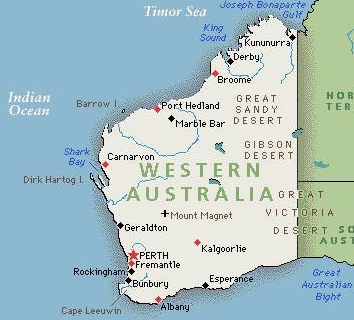 Western Australia is bounded by South Australia and the Northern Territory to the east, and the Indian Ocean to the west and north. In Australia, the body of water south of the continent is officially gazetted as the Southern Ocean, whereas the International Hydrographic Organization (IHO) designates it as part of the Indian Ocean. The total distance of the state's eastern borders is 1,862 km, and there is 12,889km of coastline. The total land area occupied by the state is 2.5 million km. The southwest coastal area is relatively temperate. Average annual rainfall varies from 300 millimetres (12 in) at the edge of the Wheatbelt region to 1,400 millimetres (55 in) in the wettest areas near Northcliffe, but in the months of November to March it is generally very dry. The central four-fifths of the state is semi-arid or desert. Annual rainfall averages about 200 to 250 millimetres (8–10 in), most of which occurs in sporadic torrential falls related to cyclone events in summer months. North Western Australia Tropical Cyclones November to April with occassional activity either side of these months and maximum occurence in January, February and March. Squalls are common particularly in the cyclone transition periods. Affecting all areas from Canarvon north encompassing all northern Australian land and sea areas. Occassional activity affecting areas south of Canarvon. It is the Northern wet season with very unpleasant, hot and humid conditions extending for areas from Tropic of Capricorn north. Rainfall accompanying cyclones is very heavy. Currents - Highly variable direction - generally running at 3/4kn to 1kn but up to 3kn in some areas . Best time May to October coinciding with the dry season. Best time June, July, August, September. Warm to hot conditions with lower humidity. SE trade winds predominate blowing from E to S average force 4 to 5, stronger at night. Intense High (anticyclone) systems in the southern area can increase wind strength between force 6 to 8.The trade winds are generally associated with fine weather. Occassional tropical storms occur. Excellent conditions are experienced during this time with frequent light conditions for North western areas resulting in more frequent motoring. Strongly recommend carrying extra water and fuel in the Kimberley area Broome to Darwin as supplies are not readily available or are long distances apart Strong SE to SW winds are regularly experienced during the dry season for areas south of Exmouth making for uncomfortable passages south. Waiting for a High system with moderate E to NE winds is recommended for passages south. Strong tidal streams to 4 kn (but up to 10 kn in the approach to large bays and narrow channels) occur in the NW area together with excessive tides (rise and fall of up to 12 metres). Extreme caution navigating and selecting anchorages is required. Numerous unmarked "bombies" and shallows abound requiring careful navigation along coastal waters. See individual Port, and Anchorage. For entrance details see Australia. Note: Australian Customs will not process private yachts at Derby, Exmouth, Port Walcott or Wyndham. This page was last modified on 21 August 2018, at 15:02. This page has been accessed 17,294 times.